Breathe life into your Calgary Landscape. Be it a small backyard project or a full landscape redesign, our team of landscaping experts are here to help. No project is too big or too small for Solkor. We are happy to provide you with a range of landscape construction services in Calgary and surrounding areas that can help brighten up an existing space, redesign a dated yard, or create the outdoor living area you've always desired. Add curb appeal to your Calgary home with a well-designed driveway or walkway that blends into the landscape. Or create a welcoming outdoor retreat with a sophisticated backyard patio. Turn the grade changes on your property into beautifully-landscaped features with Solkor's creative retaining walls constructed from a variety of materials, including wood, stone or concrete. 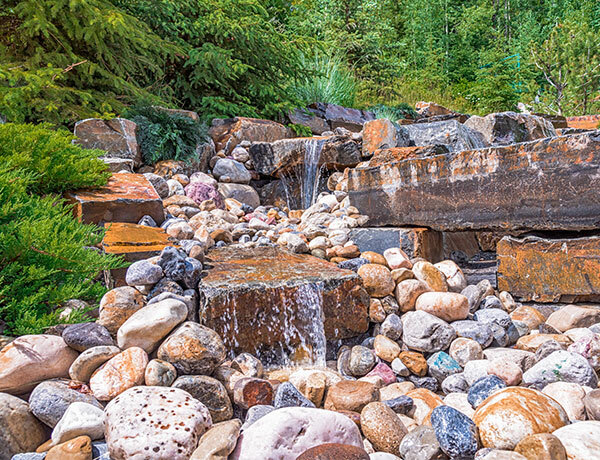 Beautify your yard with a custom water feature. Whether you are looking to compliment an existing space or create the focal point for a whole new landscape, our custom water features leave a lasting impression. Barbecue all year long! 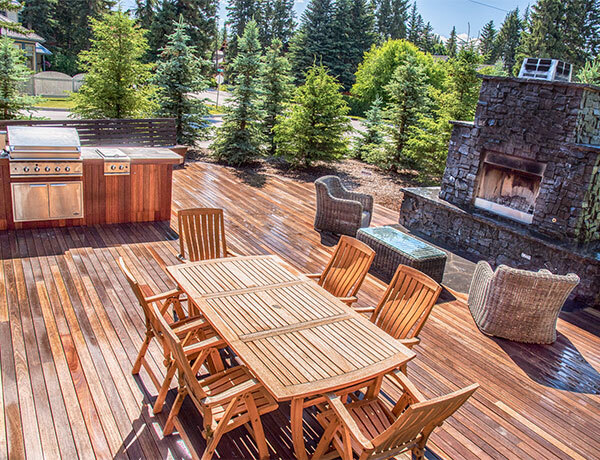 A Solkor designed custom outdoor kitchen will have you cooking outside year-round, no matter what Calgary’s winter has in-store for us. 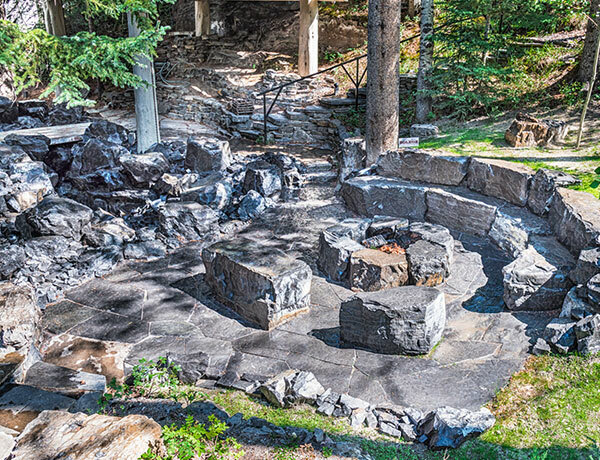 Add intimacy and warmth to your outdoor oasis with a custom fire pit by Solkor. Whether you're entertaining guests or chilling with family, your custom fire feature brings the heat. Enjoy the luxury of custom design and quality construction. 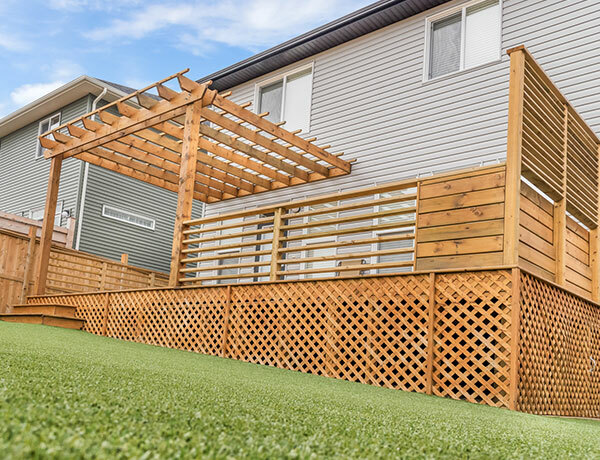 Solkor's decking and fencing solutions are built to last and blend seamlessly with your space. Our pergolas enhance garden spaces and sitting areas. Sink into luxury and surround yourself with the gorgeous outdoor scenery in a regular or sunken hot tub. Whether it blends into your deck or is surrounded by custom stone work, your hot tub will become an eye-catching feature. Relax knowing that your landscape has been built to withstand Calgary’s unique weather challenges and the test of time. Erosion prevention and proper drainage solutions are a key part of all of the landscapes we create… They are built to last. Leave those obtrusive concrete retaining walls behind. 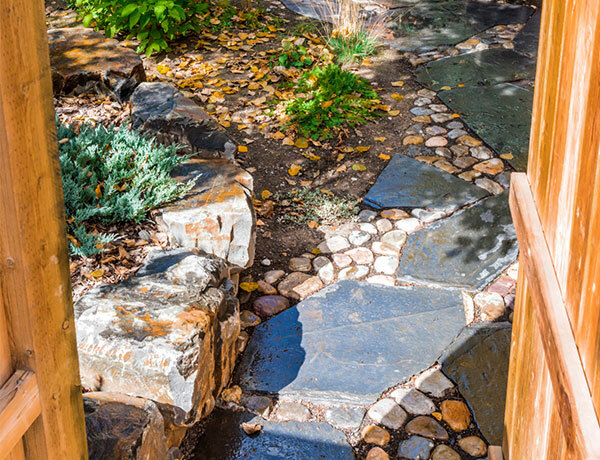 Inspired by the Rocky Mountain landscape around Calgary, Solkor can create beautiful concrete and stonework including walkways, seating, flagstones, canyons, and garden features. Add warmth and style to your Calgary home with custom lighting for walkways and seating areas. Eliminate the need to set-up sprinklers and keep your yard looking vibrant with our low-maintenance irrigation systems. We know Calgary winters can be tough on your landscaping. At Solkor we’re equipped to execute projects all winter long. Our winter landscaping services can save you time and money, and help you get closer to a finished product by the time the snow stops flying.